Our state-of-the-art dental equipment includes digital x-ray, an ultrasonic scaler, and a high-speed dental drill and polisher. Whether your cat or dog requires a routine cleaning to help combat bad breath, or a more advanced procedure to help eliminate the pain of a fractured, abscessed, or decayed tooth, you can be assured that your pet will have a gentle and comfortable experience at the Cochrane Animal Clinic. All of our dental procedures are performed under anesthesia. Nobody likes going to the dentist, but with our wide range of safe sedation and anesthetic agents, we can ensure that your pet will be pain-free, stress-free, and will wake with no memory of the experience. Having your pet sleep quietly through the dental procedure also ensures that our veterinarians can be extremely precise and detailed while they work in such small mouths. Pain medication is always provided for our patients who have undergone extractions. Not only do we freeze their mouth prior the procedure, but they are also sent home with the appropriate medications to ensure they heal in comfort. 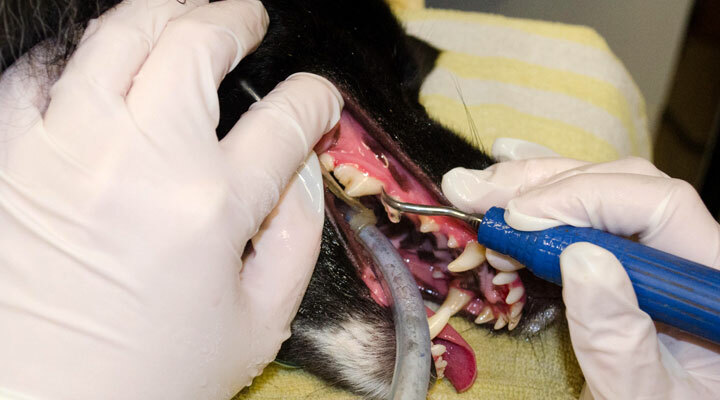 We also offer equine dentistry services including floats and wolf tooth extractions.